Our car hire fleet for 2018 includes 'Group 2' vehicles - medium-sized hatchbacks that offer enough space for passengers and their luggage, whilst being economical and easy to park. If you require a different class of vehicle such as a van or MPV, then please get in touch as we may still be able to help. 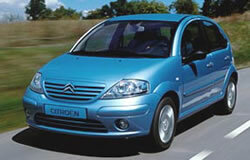 Medium-sized hatchbacks like the Citroen C3 or Ford Focus.